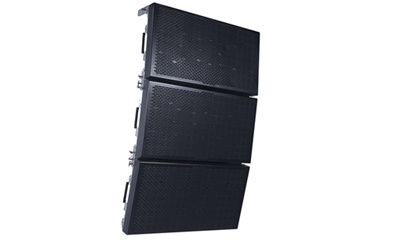 The K-array KH4 is a high performance self-powered, 2-way line array speaker system. At just over 47 Kg (100 Lbs) and 16 cm deep (6 inches), its ultra-compact aluminum enclosure contains an incredible reserve of power. that ensures very high sound pressure, with wide consistent (120°) horizontal coverage. It has the unique capability for varying the vertical coverage from 7° (line array applications) to 37° (stand alone). The KH4 is suited for medium to long throw applications in theaters, stadiums, houses of worship and concert halls. The KH4 integrated with the KS4 self-powered dipole subwoofer, creates a high performance large scale solution. The KH4 can also companion with the KH15 satellite, and KO70, KO40 self powered sub bass elements. The KH4 uses twelve 8-inch cone drivers with 2.5” voice coils for low-mid frequencies, powered by six power amplifier channels. The mid-high frequency section uses five 1.75” voice coil compression drivers mounted on 1”x 4” constant directivity waveguides. The drivers form an array exactly in the centre of the speaker. A mechanical system can provide different vertical coverage from 7° to 37° on each KH4. An internal DSP module provides configuration presets. Dedicated remote control software allows for control of the speaker from a computer. All KH4 components are designed by the K-array R&D department and custom made under the K-array quality control system in Italy. – Integrated DSP and remote control. – Integrated flying and stacking hardware. – Top quality components for outstanding performance. – Ultra-fast set-up and dismantling system. – For use as a stand-alone PA system, as an element in vertical line arrays and in combination with other K-array systems.